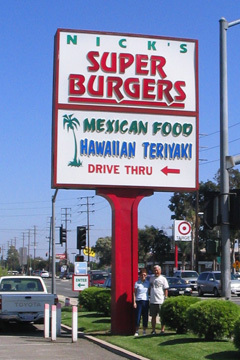 Lawrence and Lillian Chun stopped for some Hawaiian Teriyaki at Nick's Super Burgers in La Habra, Calif., while visiting their son, John. "The Search for Signs of Hawaiian Life in the Universe" is just that: We're looking for evidence of Hawaiiana everywhere but Hawaii. Send snapshots and a description to TSFSOHLITU, Honolulu Star-Bulletin, 500 Ala Moana, Suite 7-210, Honolulu, HI 96813; or e-mail JPEGs or TIFFs to HiLife@starbulletin.com.